Alastair Cook made 189 for an aggregate of 766 series runs and Ian Bell (115) hit his first Ashes ton as England ran riot on day three of the final Test. With Australia needing to win to avoid losing the series, their hopes looked bleak as the tourists reached 488-7. That gave England a lead of 208 at stumps and represented a fine day’s work from a morning start of 167-3. The only blemish was the latest in a long line of failures for Paul Collingwood, who was out for 13. The 34-year-old has an average of 15.54 in his last 10 Test matches and may not get a chance to remedy it in the second innings. Kevin Pietersen is enjoying the verbal exchanges in this series. However, Matt Prior has complained Peter Siddle went too far in a heated clash during the Perth Test, claiming it was like a boxer kicking his opponent when he is down. Sledging has become the topic du jour after a number of heated exchanges in the third match, with most players on both sides saying they enjoy the contest on all levels. But Prior said in his English newspaper column that Siddle went too far. “The Australian fast bowler had launched a short-pitched round-the-wicket attack,” he wrote. 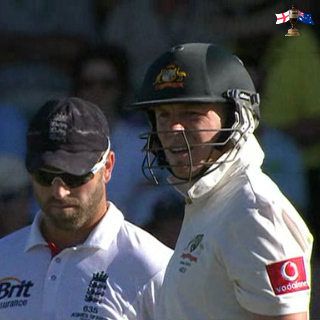 England fought back gallantly with three wickets before the close, including that of Ricky Ponting, cheaply again. But to concede 81 runs on first innings gives your opponent a huge fillip and for that Australia have Johnson, his cherry blossom tattoo clearly sprouting thorns here, to thank following his brilliant 6-38. The Waca has proved a forbidding place for England’s batsmen for the past decade or so, and this was no exception. Peter Siddle scored a quick 35 not out. Australia’s hopes of regaining the Ashes have sunk further after another top order collapse on the first day of the Third Test at the WACA. At stumps England was 0-29 (Andrew Strauss 12, Alastair Cook 17) in reply to the home side’s 268 made after it was sent in on a bowler-friendly pitch. 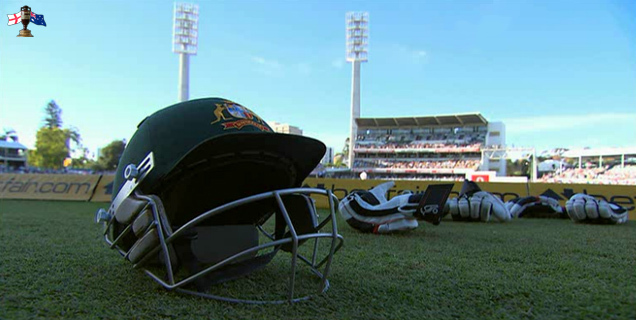 Australia was bowled with an hour left to play after recovering somewhat from a disastrous start. The full house at the WACA was treated to an old-fashioned flurry from Australia’s lower order late in the day, including a last wicket stand of 33 in quick time by Peter Siddle (35 not out) and Ben Hilfenhaus (13). Earlier Mitchell Johnson (62 from 93 balls, eight fours and a six) and Brad Haddin (53 from 80 balls, six fours and a six) helped add some respectability to a scorecard that was looking very sick at 4-36.